I grew up in a smoke bomb state. This meant that every Fourth of July, while kids with cousin-suppliers in neighboring states threw firecrackers, I rolled harmless smoke clouds across the driveway. Occasionally, bribes would win a handful of my own, but this precious gold was reserved for model battleship wars on New Year’s Eve. As the Fourth of July approached this year (2011), I saw the railroad car-sized booths being set up along the roadside and couldn’t resist knowing what deadly horrors awaited me there. I realized I hadn’t lit a firework in some twenty years, and curiosity overtook me. Armed with $40 in cash, I pulled into the long-abandoned, gravel lot and looked to make my first legal firecracker purchase. Nothing extreme, just a line or two to fulfill a boyhood fantasy. I surveyed the tiered shelves covered with colorful, odd-shaped boxes, as Jessie appeared from behind a side door in a neon yellow safety vest. I’m not sure why a safety vest was required, but apparently if the booth exploded from a misplaced cigarette, Jessie would direct us to safety. Jessie hopped to a silver envelope the size of Rhode Island, “This do?” Well, I wasn’t going to be invading a small country anytime soon, so I asked for a single string. She unzipped the top and pulled out a machine gun belt strip of ammo. “How much for just the one” I asked. “ Dollar eighteen.” For a moment, the skies cleared and I considered stockpiling my basement with silver envelopes like cordwood, but Jessie distracted me with a box of “artillery shells” she rattled like a sandwich in front of a hungry man. This was new territory. A wonder weapon in the history of the fireworks race: a new standard. She opened it and revealed six round, atomic bombs surrounding a cardboard mortar tube. They each had 10 inch fuses and I ooo’d and ahh’d while considering the possibilities. “How much for these?” I whispered, assuming Jessie was tricking me by picking out the most expensive item on the shelf, sure to drain me of my funds. “Six dollars.” I gasped as I realized I was going to leave for home with most of my money intact. Later that night, I stared at the fire in anticipation of the fireworks show I would host as the sun set in the backyard. It was the first Independence Day I had looked forward to in quite some time, since the highlights the last few years came courtesy of the Boston Pops and a television. My wife had a visiting guest from Oregon, so I decided to spice up the event with a trip to the market where I bought graham crackers, marshmellows, and chocolate bars. These are all ingredients in a devious invention called s’mores that can produce a feeding frenzy even among the most fiber-conscious of eaters. I set up the chairs and stirred the coals as the pair of them arrived, thinking the whole time of my fireworks hidden behind the washing machine. We caught up on all the gossip from my hometown, discussed the different merits of contrasting marshmellow roasting techniques (slow burn vs. blackened flame out), and played with my Wheaton Terrier who seemed confused by it all, until full darkness crept in around us. Finally, it was time; I attempted to warm up the crowd with sparklers and something called a Tequila Sunrise which shot colorful, evolving sparks three feet into the air until it fizzled out. 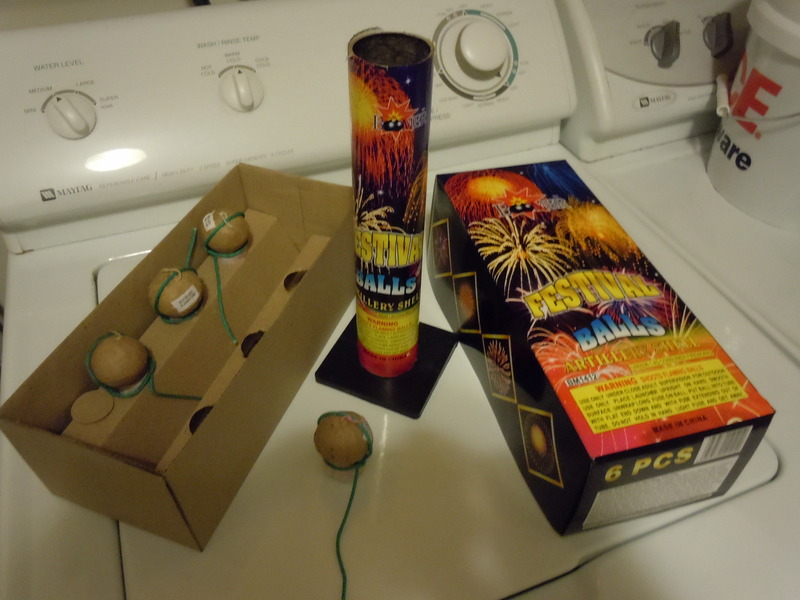 Then, a devious grin covered my face; it was time to summon the mortar balls of destruction. I inched them from behind the washer with desperate fingertips, pressing my gut into the corner, and gasping for breath as I just managed to pull them out. I giggled, and ran across the deck pulling the cardboard mortar from its sheath while rereading the instructions. “You’re such a little boy,” my wife complained, the fire reflecting in her eyes. “Today everyone’s a little boy, my sweet,” was my reply. As I set up the cardboard mortar, my eyes raced from the instructions to the launch pad, and I decided to heed the packaged advice and mark my run spot some twenty feet away. I warned the jolly pair still noshing on marshmellows of the recommendation, but they laughed and thought I was joking. Finally, I unfurled the long, green fuse and held the burning punk (stick lighter) near the steady fuse until…….PPPFFFFFFTTTT!!! It exploded to life and I ran between the chairs in bouncing childhood delight as my wife and guest chatted away. The sparking line descended the tube and then………………..FFFOOOOOOOMMMMPHHH………………….CRACK……..PUH-POW!!!! Red, white, and blue fizzes of light exploded in a 30 foot diameter some fifty feet in the air, rocking windows and echoing off the neighbor’s home. My wife and friend sat open-mouthed with their heads turned skyward, their backs pasted to their chairs. “Should I light another?” I asked, a dim smile covering my face. There was no reply, but they immediately stood up and moved their chairs twenty feet from the launch pad. A dream fulfilled, I didn’t hear a peep from the neighbors for the next day and a half, my wife no longer found fireworks so childish, and once again, the rockets’ red glare ruled the night.